All the entertainment and insight you need is on an el platform, surrounded by automobile traffic. For more than a decade I rode the Red and Brown Lines to work, peering down at cars and pedestrians as my train groaned into the Loop. 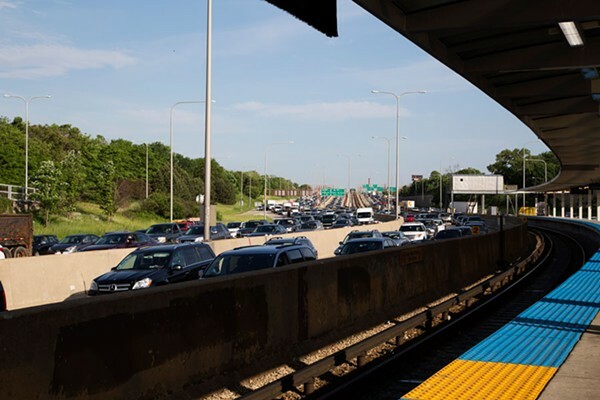 So when I moved recently to Avondale, along the Blue Line, I was startled and strangely excited to be waiting for my train on a platform smack in the middle of the Kennedy Expressway. The platform is flanked by four lanes heading north, four lanes heading south, and two reversible express lanes, and if you wait at odd hours, as I often do, the traffic really screams by, especially in the express lanes. It's like the Indy 500, if the drivers in the Indy 500 were all fat and bored and listening to talk radio. Speed can be intoxicating when you're inside a vehicle, but no less so when it tears past you at close proximity. Who can read a book when there's that kind of brain-dead entertainment to be had, and all for the price of a little carbon monoxide inhalation? Even when traffic slows to a crawl, the platform offers endless amusement. No city intersection, no matter how big, can deliver the people-watching opportunities of a ten-lane expressway. Sealed into their cars like aquarium fish, drivers are lost in their own little worlds: they eat, put on makeup, sing along to the radio, talk to people on Bluetooth devices. Sometimes, when the train is slow to arrive, I make up extra verses to "Eleanor Rigby" for the people who roll by: Eddie Kilpatrick, late for a boiler repair out in Arlington Heights / Speed as he might. . . . Anna Moustapha, hoping her dress will attract the new guy in IT / To some degree. . . . Monica Jackson, giving her oldest a smack so he'll learn to be still / Damned if he will. . . . All the lonely people, which exit ramp is theirs? The unconventional rest stops are a distinctive feature of the U.S. roadway system. Without it, riding the subway would be even worse than it already can be.